Out in the blizzard, Raph is determined to track Ninjara when he is accosted by a huge polar bear. The bear throws him around like a ragdoll and eventually tosses him off a cliff. Raph cracks his head on a ledge and passes out as the bear trudges off. Elsewhere, the wolf-woman Revyen awakens Ninjara, asleep in a (well-furnished) chamber. 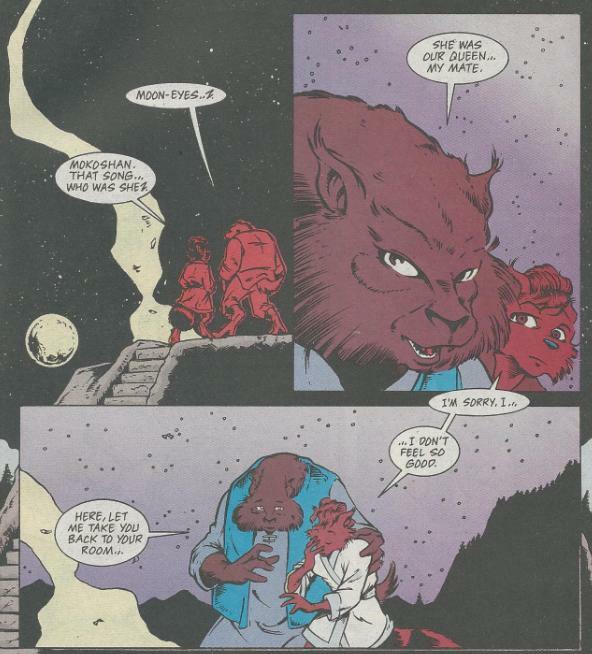 Revyen begins to tell her the true meaning of “Moon-Eyes” (the name Mokoshan gave to her) when Mokoshan comes in and orders Revyen to leave. Seeing Ninjara still groggy, Mokoshan tells her to go back to sleep. 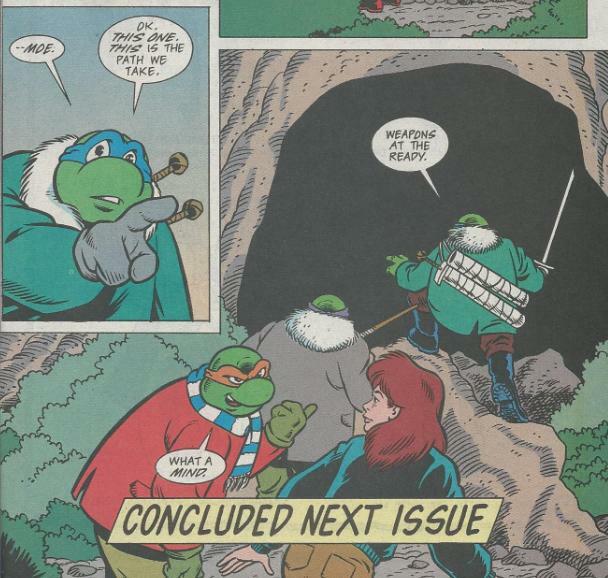 At the camp, the blizzard has finally died down and the Turtles and April decide to go after Raph. Mike finds a series of slashes made by his sai in the trees and they begin following the trail. Speaking of Raph, he awakens at the edge of the cliff, having been rescued by the young Indian that he saw following their van the previous day. The Indian introduces himself as Dave, a descendent of the Tlingit, and asks the “turtle spirit” if he knows why so many other animal spirits have been showing themselves, lately. Raph admits to being no spirit, but refuses to accept being a teenager, either. He declares himself a man and asks Dave to show him to the lair of the “wolf spirits”. Dave escorts him to a cave with two entrances, but reveals he doesn’t know which is the right one. Raph picks an entrance at random and goes in alone. Later that night (I think), Mokoshan performs a service for Nei’Sha, his recently killed mate, and sets her corpse ablaze in a funeral pyre. The wolf-people give a farewell howl that awakens Ninjara. Ninjara goes out to see Mokoshan and he tells her whom the funeral is for. Still groggy, Ninjara passes out. The next morning (maybe? ), the Turtles and April follow Raph’s trail to the cave entrances. Leo picks an entrance and the four venture in. 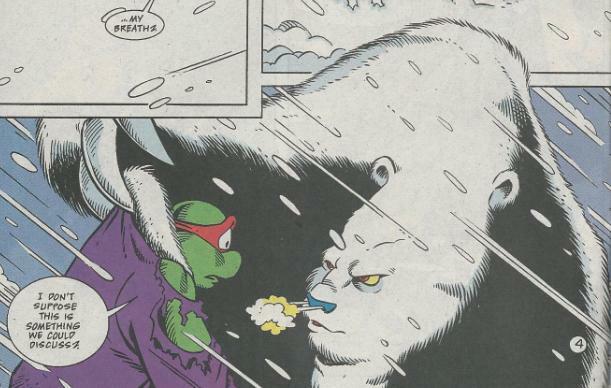 Meanwhile, inside, Raph finds himself surrounded by a pack of wolves, eying him hungrily. Contemplating a means of freeing the alpha male’s mate from the pen she’s been trapped in, Inky scratches on the front door. 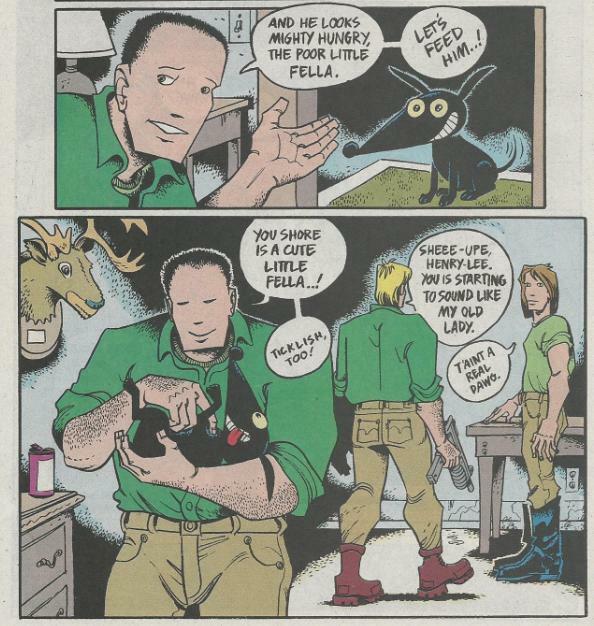 The four rednecks (Earl, Lucass, Henry-Lee and Jim-Bob) open up and immediately let the poor pup in. Finding Inky absolutely adorable, they pamper and feed the little Chihuahua. In fact, they get so wrapped up in taking care of the little guy, they fail to notice that they left the front door wide open. *This story is continued from TMNT Adventures #68. The story continues in TMNT Adventures #70. *This issue also contained a bonus Inky story by Gunther, Talbot and Lawson. Do all American Indian characters drone on incessantly about animal spirits or is that just how white people like to write them? Because sheesh. There’s not much else to say about this issue. Raphael fights a bear, though I should probably rephrase that as, “gets his shell kicked by a bear to manufacture a delay in the story’s progress”. Then an Indian shows up and goes on a long rant about animal spirits because he’s an Indian and that’s apparently what they do. And Mokoshan acts like a total creep. The End. Speaking of Mokoshan, I mentioned in jest last review that he was certainly rebounding from Nei’Sha very quickly. Well, apparently his mate’s body isn’t even cremated yet and he’s already begun pining for the next hot furry thing to come his way. And, again, considering that this guy is NOT a teenager and Ninjara most assuredly is… It’s just plain weird. One thing that confused me is the chronology of events. Everything with Raph and the Turtles takes place in the daytime, while everything with Ninjara and Mokoshan takes place after dark. The story flits back and forth between the two narratives making it look like several days are passing. I don’t know if that’s true or if Ninjara’s part of the story just isn’t occurring concurrently with the Turtles’. If it took place the night before, that doesn’t really work because the blizzard has let up. I mean, I know it’s Alaska and all, and their days and nights are weird, but I’m pretty sure they don’t have both at the same time. As for the Inky serial; it’s still heading along. Not much else to say about it, either. 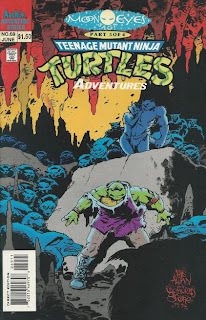 I can still remember the day I saw the cover to this issue on the comic rack and thought how amazing it might be to read an issue where Raphael battleed a whole pack of wolves in a cave while his ex-girlfriend and her new friend watched on sadistically. Yet another one of those classic TMNTA misleading covers.